In a Mars Meteorite, which came down in Antarctica, NASA Scientists found an egg from a Tardigrade. According to NASA, a 71.5 kilogram, black rock was found in December 2015 approximately 750 kilometers from the south pole. The meteorite, with the designation MIL 03346, is an “extremely seldom discovery”, says NASA spokesman Donald Savage, and identification of the specimen had taken quite some time. American researchers have found in this meteorite proof of life on Mars: a liquid, ball shape with a diameter of < 0.1 mm, which proved to be a Tardigrade egg. Incubated in this object after 19 days, a fully functioning water bear emerged. The status of water bears in our system of living things remains undetermined, since it has the features neither of arthropods nor that of aschelminthes. Tardigrades are known to be able to withstand almost any environment, including in temperatures between -272 Celsius up to 149 Celsius. 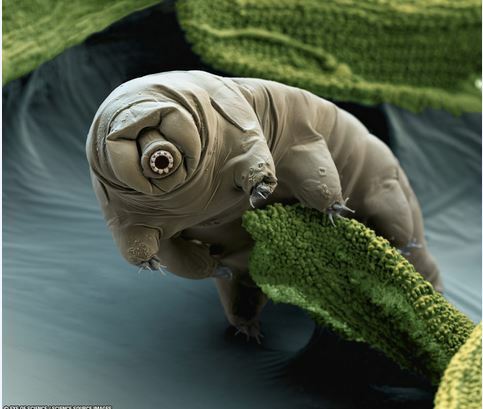 Even in the vacuum of space, a fully formed tardigrade can survive more than a week. This appears to be the first sound proof for life on Mars. The examination of real specimens from Mars is as a result of great interest. A Mars Sample Return (MSR)-Mission is planned for the year 2020. Until then, the question of how to prevent contamination of the biosphere through extraterrestrial lifeforms remains.